Burns "The Marvin" and the "Shadows Custom Elite Guitar"
Hank Brian Marvin (born Brian Robson Rankin, 28 October 1941), also known as Hank B. Marvin, is an English multi-instrumentalist, vocalist and songwriter. He is best known as the lead guitarist for the Shadows, a group which primarily performed instrumentals and was the backing band for Cliff Richard and subsequently for Marvin, Welch & Farrar. Many leading British and Canadian rock guitarists cite Marvin as an influence on them. Sixteen-year-old Marvin and his Rutherford Grammar School friend, Bruce Welch, met Johnny Foster, Cliff Richard's manager, at The 2i's Coffee Bar in Soho London. Foster was looking for a guitarist for Cliff Richard's UK tour and was considering Tony Sheridan. Instead he offered Marvin the position. Marvin joined The Drifters, as Cliff Richard's group was then known, provided there was a place for Welch. His first critically lauded, self-titled solo album of instrumentals, which featured guitar set to orchestrated backing, was released in 1969, following the first disbanding of The Shadows, in late 1968. The single "Sacha" topped the singles chart in New South Wales, Australia, having been 'discovered' by two DJs at 2WG Wagga Wagga. Marvin's solo career was then suspended due to Shadows reunions, first for a Far East tour and 'live' album in 1969, then a studio album in 1970 (Shades of Rock) and again in the early seventies. He has experimented with styles and material, doing instrumental albums, some with mostly vocals (e.g. Words and Music, All Alone With Friends), one with only acoustic guitars and one with a guitar orchestra (The Hank Marvin Guitar Syndicate). In 1988, Marvin collaborated with French keyboardist and composer Jean Michel Jarre on the track "London Kid", on Jarre's Revolutions album and was a guest in the Jarre's Destination Docklands concert at London's Royal Victoria Dock. Jarre said The Shadows' success had influenced him and led to his decision to devote his career to instrumental music. 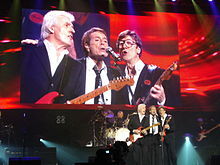 In London, Hank Marvin is cockney rhyming slang for "starvin" ("starving"). This slang was referenced in a 2012 television advertisement for Mattessons meat company. His first wife was Beryl, with whom he had four children; Dean (born 1962), twins Peter and Paul (born 1963), and Philippa (born 1966) Dean died from pneumonia in 1997. He is currently married to Carole, with whom he had two children; Thalia (born 1973) and Ben (born 1975). Since 1986, Marvin has lived in Perth, Western Australia. He has made impromptu appearances on stage when musician friends visit the area, such as in February 2013 when Cliff Richard held a concert at Sandalford Winery. He is a Jehovah's Witness. Marvin runs a recording studio, Nivram studios, part of Sh-Boom studios in Tiverton Street, Perth, owned by Trevor Spencer and Gary Taylor. Marvin influenced many British rock guitarists, including Syd Barrett, George Harrison, Eric Clapton, David Gilmour, Brian May, Mark Knopfler, Peter Frampton, Steve Howe, Roy Wood, Tony Iommi, Pete Townshend, Ritchie Blackmore and Jeff Beck. In Canada, Cliff Richard and the Shadows had top 10 hits, especially from 1961 to 1965. Canadian guitarists Randy Bachman and Neil Young credit Marvin as influential. ^ "No. 42885". The London Gazette. 4 January 1963. p. 197. Retrieved 17 June 2009. ^ Barnes, Jim; Dyer, Fred; Scanes, Stephen (1986). The Book Top Forty Research 2nd Edition 1956-1985 (doc)|format= requires |url= (help). Top Forty Research Services, N.S.W. Australia, after having been "discovered" by two DJs at 2WG Wagga Wagga. ^ "H". London Slang. 4 May 2010. Retrieved 31 December 2011. ^ a b c d "Hank Marvin: Everyone Has To Move On". ultimate-guitar.com. 25 September 2007. Retrieved 24 June 2014. ^ Prown, Pete; Sharken, Lisa (2003). Gear Secrets of the Guitar Legends: How to Sound Like Your Favorite Players. Hal Leonard. pp. 63, 66. ISBN 1617745014.